Unfortunately, the use of green or damp lumber in new construction can lead to mold problems before a house is even complete. You can have a sick building before you have a building at all! How dry is dry enough? The USDA recommends wood used in construction be between 15% and 19% moisture. Eventually, the moisture content of wood used in construction will level out relative to the climate of the area where the structure is built, which could be a very low 6% or as much as 12% in damper climates. Problems crop up, however, because of shrinkage of the wood after construction is complete. What kind of problems arise from using wood with a high moisture level? Unfortunately, these problems are difficult or impossible to fix later, so it is important to avoid them during construction. There are also health issues associated with the use of wet lumber in construction. Anything that is damp can be a haven for mold growth, and new construction is not immune. Even if your home has never had a leak, you can have mold growing in the framing that you cannot see, but only suffer from symptoms which include: headaches, allergic reactions, asthma attacks, infection and even death. The best way to prevent all of these problems is to dry out the framing before enclosure and the best way to do that is with the ThermaPureHeat process. ThermaPureHeat reduces the level of moisture in timber framing 6-12%, allowing it to reach a moisture level balanced with the climate, and allowing the structure stabilize before enclosure. ThermaPureHeat prepares framing for the process of becoming a safe and healthy home. Alliance Environmental Group offers ThermaPureHeat for construction drying, as well as mold remediation, pest control, termite treatment and odor reduction, all of which we will be discussing on the blog. If you are in California and are building a new house, make sure the wood used in your framing is dry and balanced with your climate. Take a look at the wood and make sure it isn’t moldy. If the wood is wet, green or has mold issues, contact Alliance for a high heat treatment with ThermaPureHeat to be sure that your structure will be stable and healthy before you get too far into the construction process! Wendy Stackhouse is the Online Community Manager for Alliance Environmental Group and AirTek Indoor Air Solutions. We welcome your comments! For more news and tips or to ask questions of our experts, Like us on Facebook and follow us on Twitter! 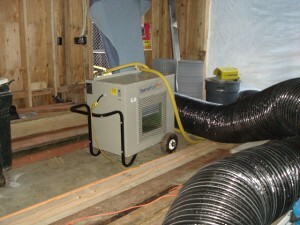 For updates on indoor air challenges, Like us at AirTek on Facebook!